Neither protection nor aesthetics need to suffer where the fence is to be made permeable. 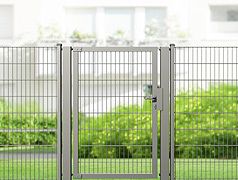 Swinging gates by LEGI continue the positive properties of LEGI fence systems to the point where permeability is sought so that there are no security gaps in the zone to be protected. Since gates are the points of the highest stress on the fence in everyday life, great value is placed on particularly durable designs. LEGI Klassik are 1, 2 or 3-section gates, which are manufactured up to a height of 4 metres. Variable gates, the stop of which, i.e. opening to the left or right, can be freely selected on site.